Moore is a tattooer at Sanctuary Tattoo in Portland, a tattoo shop she founded and co-owns. She helps people express their emotions, dreams and memories through the art of tattoo. And she does it with a unique blend of artistry and spirituality. “Most people who come to me are on some kind of path of personal development or spiritual growth,” she says. “Jen’s work is an organic collaboration of intuition, client desire and passion,” says Melissa Rivera, shop manager for Sanctuary Tattoo. Rivera and Moore work together, but Moore also designed and executed one of Rivera’s many tattoos. Moore has long been interested in decorating her body. Growing up in Massachusetts, she would mix food coloring into baby powder to create makeup and paint her friends faces. After attending art school, she worked as an intuitive and offered psychic readings, which ultimately led her to graduate school where she earned her Master of Arts in Psychology and Religion from Andover Newton Theological School in 1997. 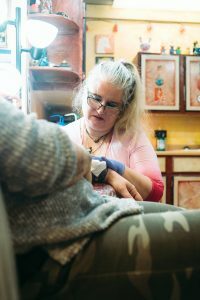 During a festival where Moore taught healing classes, she met a tattoo artist and her interest in the profession was piqued. 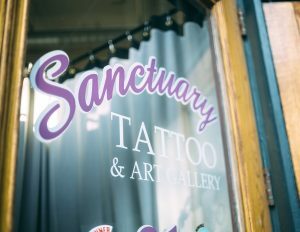 By the summer of 1999, Moore and Chris Dingwell opened Sanctuary Tattoo in Portland where she honed her skills. Since then, she has combined her artistic prowess, intuitive nature and background in psychology and religion to create a unique tattooing experience for all her clients. 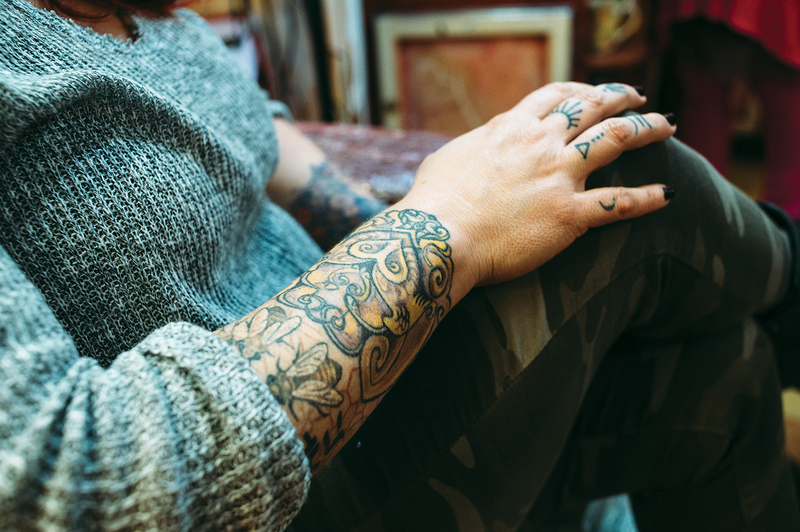 Moore approaches tattooing with a colorful, ornamental and decorative style. She considers placement to be as crucial as its design. While she works with clients to develop the best tattoo, she readily admits her work tends toward whimsical and fun, drawing from botanicals and Victorian illustrations. She works from photographs sometimes, but the final product has an illustrated quality. This style is what attracted Kait Pressey to Moore when she was ready to execute a new tattoo idea. Since that first tattoo Pressey hired Moore to do—a halved pomegranate fruit with seeds spilling out placed at the base of her spine—she has continued to be a canvas for Moore’s art. Pressey admits Moore’s artistic and spiritual style isn’t for everyone. However, Pressey says nobody else will ever tattoo her. Through her work, Moore has developed a number of long-term relationships with her clients. For more information about Jennifer Moore’s work, visit medicinetattooing.com or to learn more about her intuitive mentoring, visit modernmedicinelady.com. Emma Bouthillette is a Biddeford, Maine native whose first book “Biddeford: A Brief History” is scheduled for a June release through Arcadia Publishing. When she is not working or writing, she’s either enjoying a good book or walking Miss Savvy, her Pembroke Welsh Corgi. For more information about Emma, visit www.emmabouthillette.com.